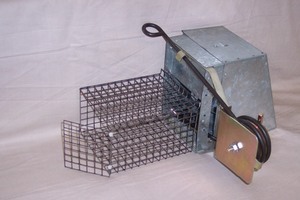 To comply with The Spring Traps Approval legislation the Kania spring trap must have an appropriate restricted access tunnel fitted in front of the entrance in most situations. The Kania 2000 trap provides a high degree of certainty of killing and a high degree of safety for the trapper when setting. It is shown below with the optional Elgeeco restricted access tunnel fitted in front of the entrance which reduces the risk of protected species and non-target domestic pets entering and being killed or maimed.